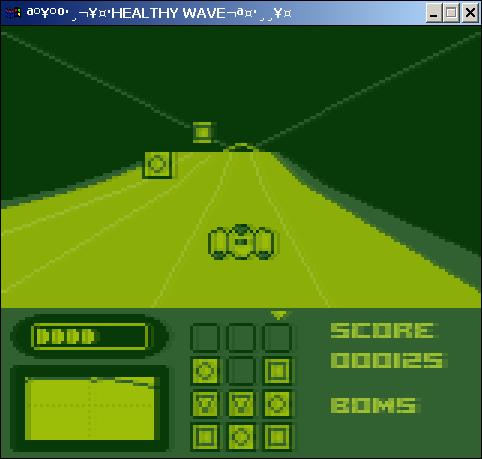 This is a demake of AudioSurf in Gameboy style. I did it in four or five days to enter the Bootleg Demakes Competition at TIGSource. Graphics by UltraJMan of the TIGSource forum. Music kindly provided by Multifaros. A TIGSource Bootleg Demakes Competition entry. Cursor keys - Move left and right. Ctrl - Drop bomb into current lane. music for this game! Visit his homepage at http://multifaros.info.se/. This game is written in D.
SDL - LGPL license (lgpl-2.1.txt). http://www.libsdl.org. SDL_image - LGPL license (lgpl-2.1.txt). http://www.libsdl.org/projects/SDL_image/. SDL_mixer - LGPL license (lgpl-2.1.txt). http://www.libsdl.org/projects/SDL_mixer/. freetype2 - FreeType license (ftl.txt). http://www.freetype.org/.